and this is the 2nd year that I’ve talked about camo. I’m thinking we can all agree now that camo isn’t going anywhere. It’s proven itself in the fashion world, and although it will make you feel cooler (as I’ve always promised) :), I think we can all feel safe that it isn’t just a trend that’s going to be here today and gone tomorrow. I got my first pair of camo pants from GAP a little over 2 years ago (no longer available) and I got another pair last year from LOFT (also no longer available). 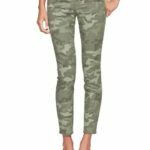 And until recently, I wasn’t posting a lot of outfits with my camo pants, because I couldn’t find any similar that were currently available for you girls! But, as you know, I found some last month that I loved! I didn’t get them (since I already have 2 other pairs…that’s what they call restraint ladies) :), but if you’ve been on the hunt for some, I think you’ll love these! And they are only $54!!! Here’s the pair I found! For size reference, I’m wearing a 7 in the jeans and a small in the swing tee. For size reference, I’m wearing a 7 in the pants. They didn’t have a 5 for me to try on, so I can’t comment on the difference in the sizes. When dealing with junior’s sizing….sometimes I’m a 5, and sometimes I’m a 7. Click HERE for the pants! 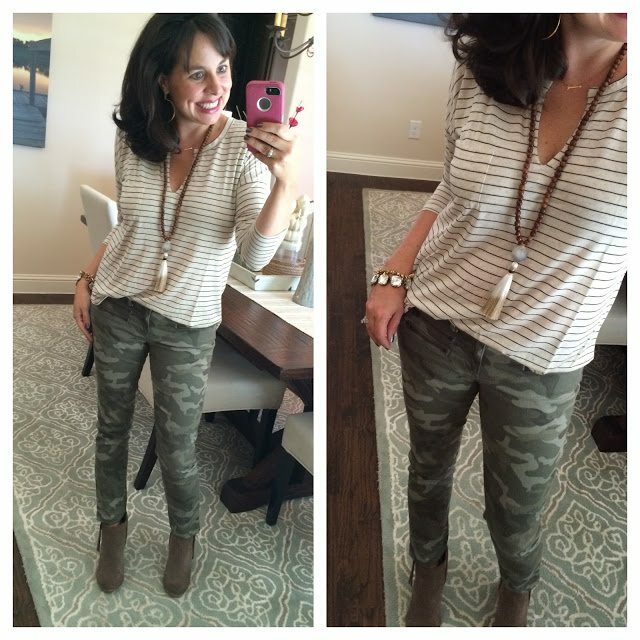 So today I’m going to show you 3 different ways to style camo pants. today will speak to you. 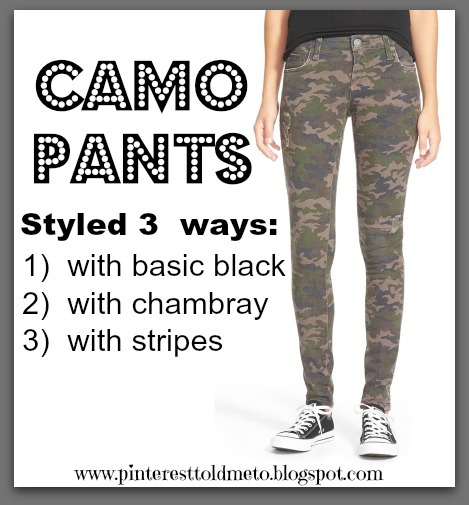 And if you are already the proud owner of some camo pants, hopefully you will get some new outfit ideas! 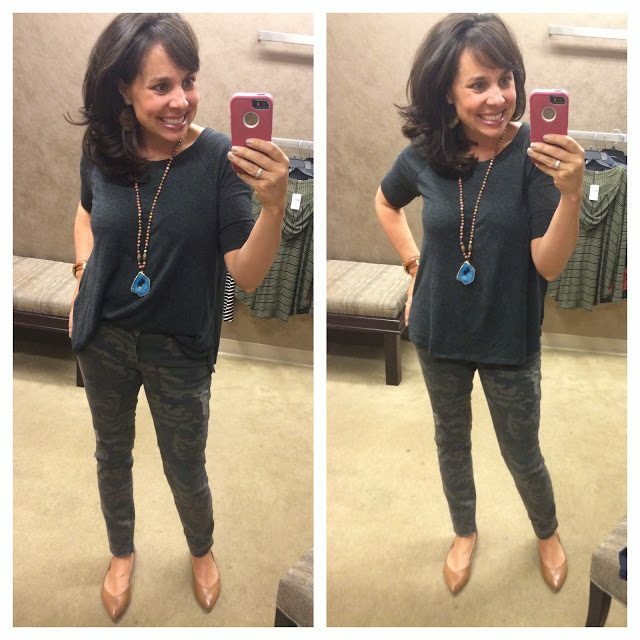 In today’s outfits, I’m wearing my camo pants from GAP that are nearing 3 years old. But again, if I didn’t already own these (and a pair from LOFT that I bought last year), I would have for sure bought the above pair. You can also click HERE to see some others that are currently available at Nordstrom. There are 2 pair to choose from HERE at Anthropologie. (FYI: I also looked at LOFT, GAP, Old Navy, Banana Republic, J Crew Factory, and Target. And I didn’t find ANY. Your best bets are going to be Nordstrom and Anthro.). This is one way to wear camo that is a no-brainer. You can be any age and pull this look off! I paired the pants with a classic black v-neck sweater and booties. And here’s something fun….this is a lightweight cashmere sweater that comes in lots of different colors (and it comes in regular and petite). Get Look #1 For Yourself Here. Even though the thumbnail pic has a white sweater, if you click on it, it will take you to the black sweater I am wearing. And the black booties will take you to a taupe pair as well. 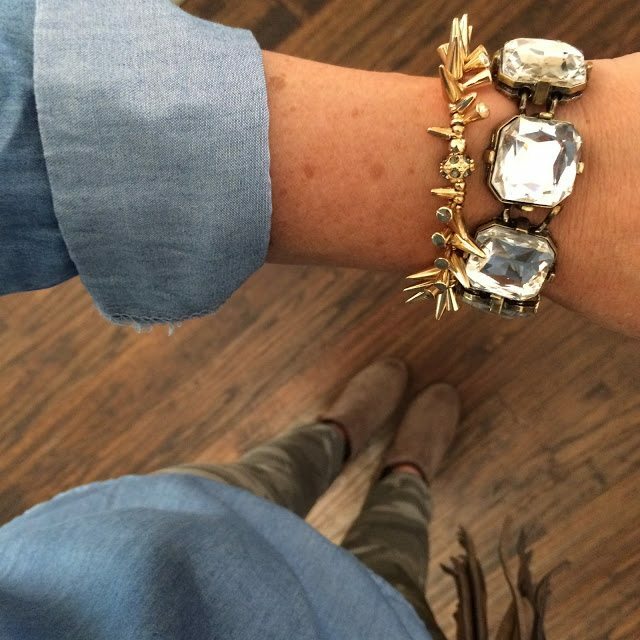 Pairing chambray with denim just makes sense to me. 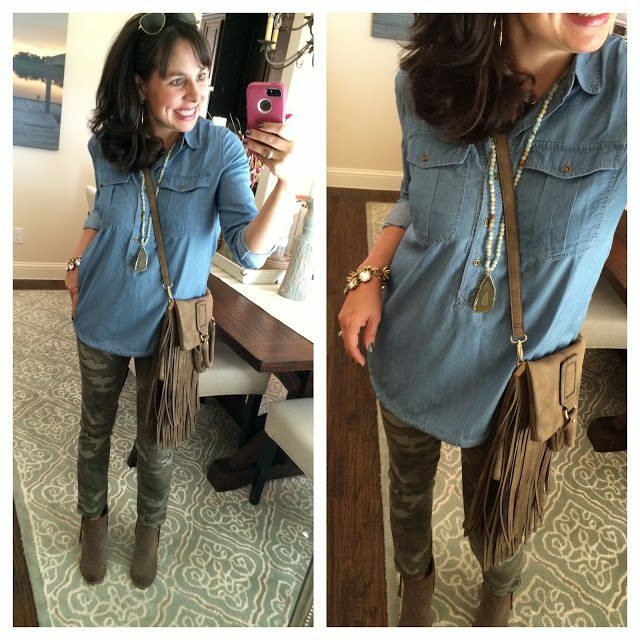 And when you layer on a fringe bag and a fun necklace, you’ve got a great look! For size reference, I’m wearing a small in the chambray shirt, so it’s true to size. Get Look #2 For Yourself Here. 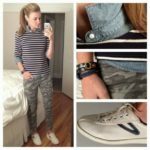 If you’ve already been wearing camo for a bit now, you might be brave enough to go ahead and mix it with stripes. I happen to love camo with stripes. honest, it is a bit itchy. It’s also kind of thin, so I would recommend a cami under it. Yes, I’m wearing the same bracelets again. The overhead look for instagram! And then I layered on the baby blardigan, BECAUSE WHY THE HECK NOT. I’ve received LOTS and LOTS of messages from y’all about the baby blardigan. Lots of you are loving it even more than the original blardigan because it’s so much easier to wear outside of the house! And because it has pockets. Click HERE for the baby blardigan. And what about this for a BONUS Look #4?!? I think this is a great look too! THIS hoodie with THESE camo pants and THESE shoreline converse (other colors HERE). And when looking for camo pants for y’all (at TONS of different stores online), I ran across THIS camo quilted twill jacket from Express. And if you are interested in a camo bag, Barrington has you covered! You can get it in the green camo or the grey camo. You can even get your initials monogrammed with their new monogram stripe in the colors of your choosing! Go HERE, go to the “New Arrivals” on the top left, and then click on “Monogram Stripe Collection”. Pick your style of bag, then pick your pattern, and then pick your monogram colors. So, I think it’s obvious that I am firmly on the EMBRACE CAMO side of the field. 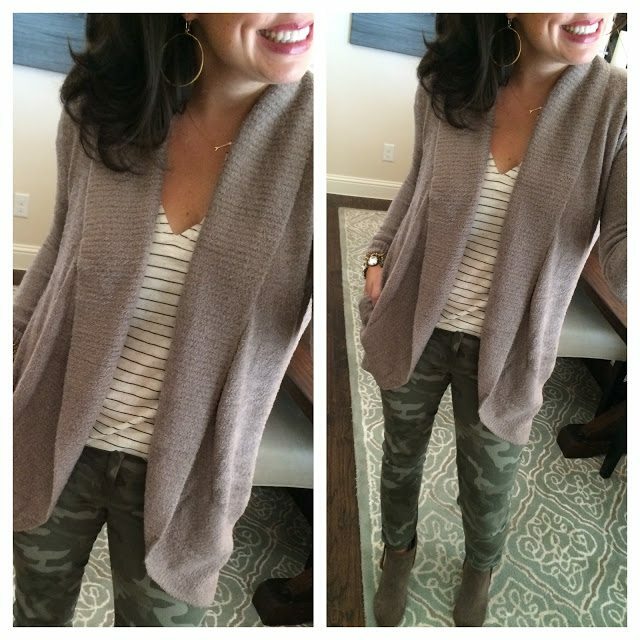 If you still need convincing, click HERE to see my camo board on Pinterest! It should probably be on you too. If you follow me on facebook, you saw this outfit over the weekend. We went to a pumpkin patch birthday party on Friday night as a family, and this was the perfect attire! (Please notice that the girls at Accessory Concierge let me know last night that the PTMTazul code will be active today as well…but this will for sure be the last day. LOFT now has 40% OFF of all sweaters and pants! Which means THIS navy sweater of my sisters (that y’all went BONKERS for over the weekend) is still on sale. And so is the same sweater in wine and navy HERE. And 40% OFF all pants HERE! Pinterest Told Me To Buy Camo Pants! And Then She Told Me How To Wear Them! 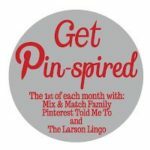 Get Pinspired! 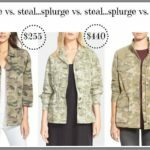 THE CASE FOR CAMO and some GIANT sales!!! Pants that don’t zip? I LAUGH in their face. The camo with the baby Blardigan. How cute is that!!!?? Love!! The camo and stripes speak to me. 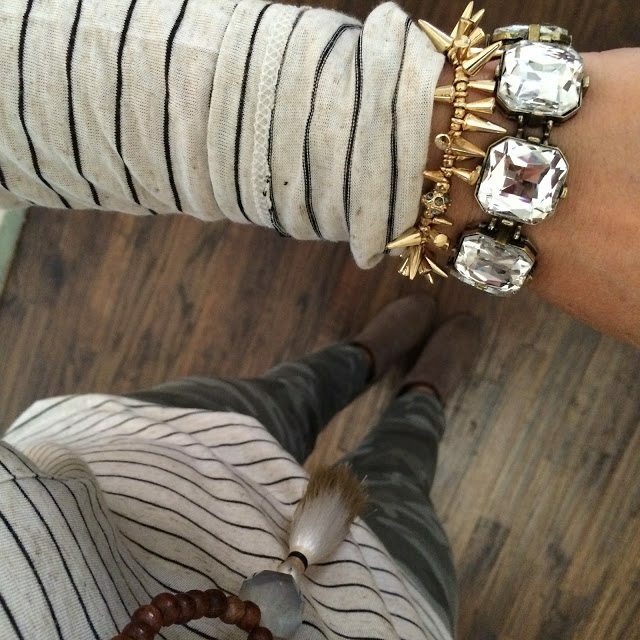 Love that combo! Yes, ma'am, love seeing you style the baby blardigan!! And, hey, I just got on board with the military jacket, it might take me a little more time on the camo 😉 but my FAVORITE was with the black top and booties. Looks FABULOUS on you! PS…I went to Old Navy and couldn't find that great denim dress you pictures one day last week (I think), maybe it's only online? LOVING the stripes and camo!!!! I love all 3 combos!!! Why am I so terrified of trying camo???!!! Bought those Nordstrom camos when you featured them last month and wear them at least once a week. LOVE them!! I ? camo! 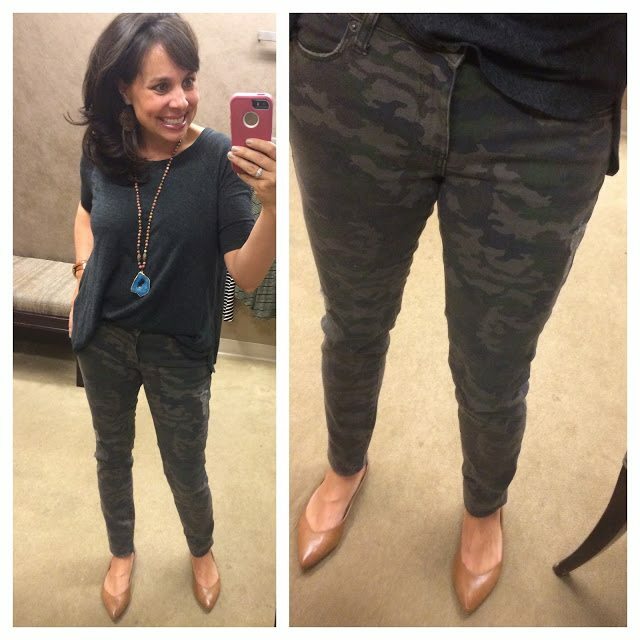 But I've never bought camo pants… However you've inspired me and I think today is the day! You inspire me!! 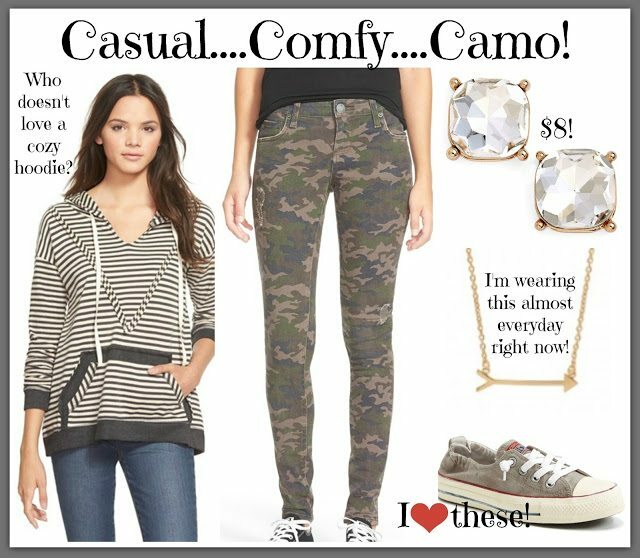 I have the camo pants but haven't worn them for about a year because I received some "fashion advice" from a certain relative, saying that I "should never wear those again!" Gah! I've been gun shy ever since! Sheaffer, thanks to your Facebook post, I bought both your sister's sweater (so did my best friend) at Loft and your plaid popover from Nordstrom on Saturday! Going to a party Thursday night and I am going to be brave and "Mix and Match" my camo with stripes! Have loved camo for a while now thanks to you. Got my baby blardigan last week and love it! Thanks a bunch. 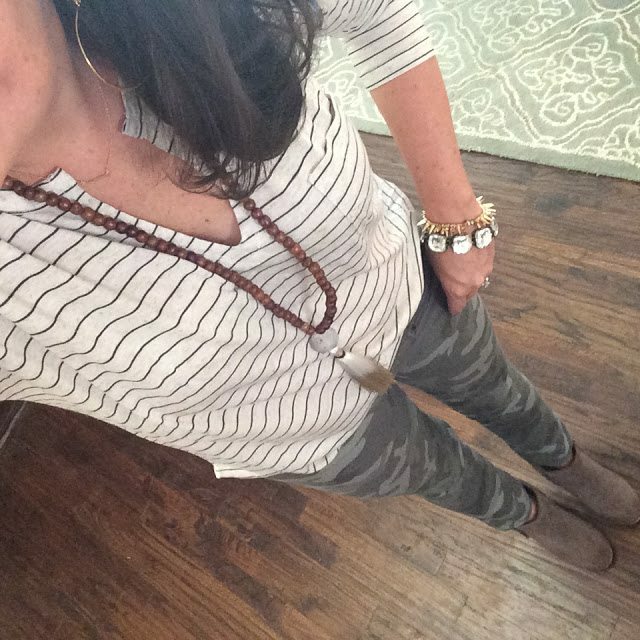 You look absolutely DARLING in each…I especially love the chambray and stripes! 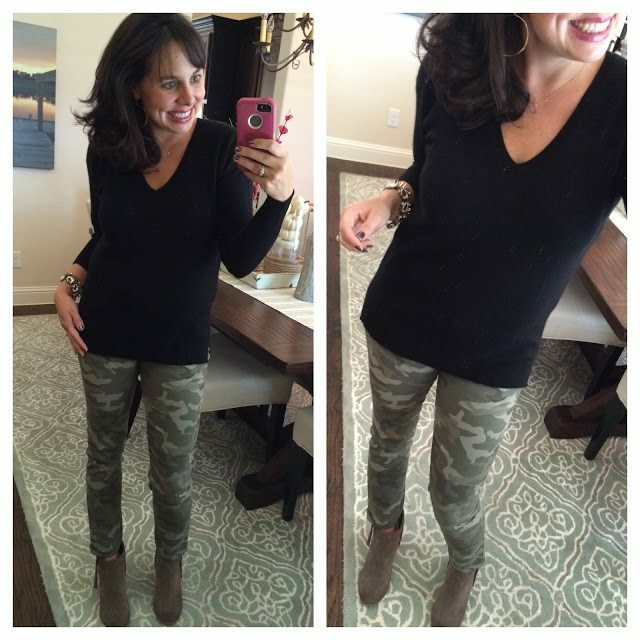 I think I'll be wearing my camo pants today…thanks for the great inspiration!! 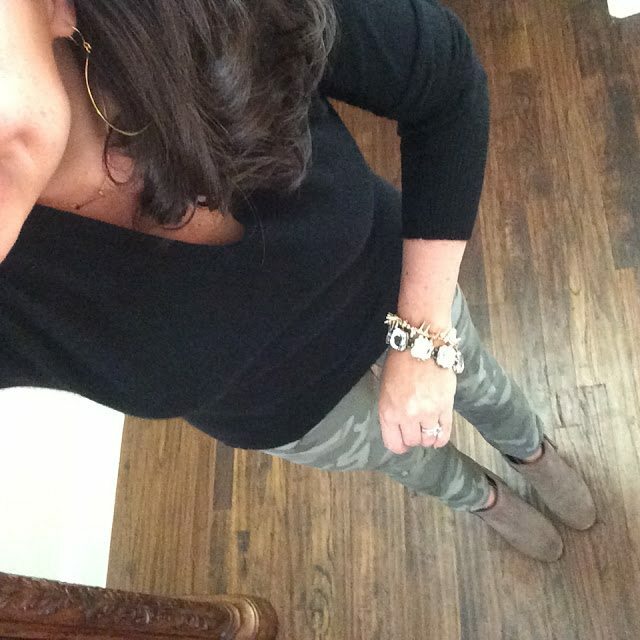 I love my camo pants from Loft and get compliments every time that I wear them. I'm a huge fan of camo with a white t-shirt too! Does the baby blardigan ever go on sale?? I WANT but can bite the bullet for $116! My sister was recently given a $200 gift card to Nordstrom! She wants me to suggest items for her to buy. I love all the items that you post on your blog, but if you had $200 to spend, which items would be your must haves? Thank you for taking full pictures in front of a mirror. I absolutely hate the selfies taken from way above the head. It seems everyone is doing that and you don't really get to see the full outfit. Hey! 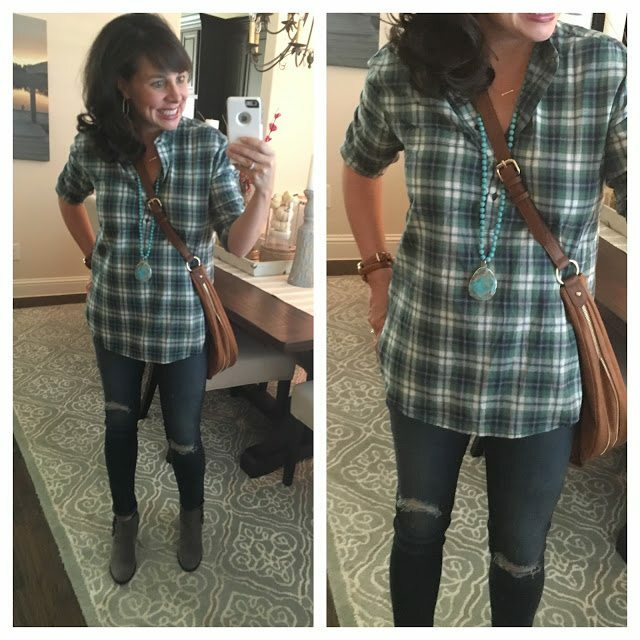 I love reading your blog & getting great outfit ideas or finding out about new products. I have two quick questions. I bought my first pair of booties this year (why did I wait so long). I really want to add some more to my collection but don't wanna spend a ton of money if they are gonna be out of style next season. I also bought my first military jacket this year. I LOVE it & really want the vest too. Do you think the military style will be around for awhile? I can't see paying $88 if I only get to wear it this year. Just wanted your thoughts! I don't own one thing that's camo, but more and more I think I should! I just checked back and they are stocked in my size (or so I hope what I ordered fits). Thanks! Woohooo! I love your blog. I would love to get a pair of camo pants. All of your outfit ideas are excellent. I know this post is from last year. Today when I searched, it seems like the only place I see camo pants is at Nordstrom and in the more expensive brands. Could you recommend any other stores to get the pants? Thanks!